Click Publish on the Engage ribbon. Use the Description field to give learners a synopsis of your interaction. The description appears on information cards in the Articulate Mobile Player app. Use the Folder field to indicate where you want to publish your interaction—for example, your computer desktop. Click the ellipsis button (...) to browse to a location. Engage will create a new folder in that spot with all the files needed to operate your interaction. 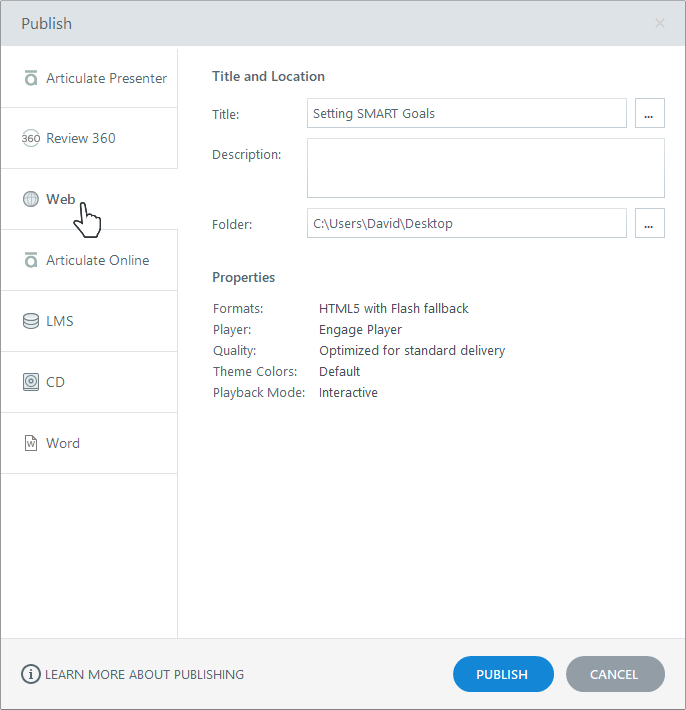 If learners use mobile devices with the free Articulate Mobile Player app, you can display additional project information in the published interaction, such as the author, duration, and version number. Click the ellipsis button (...) next to the Title field to open the Project Info window. The image below the Title field will be the interaction thumbnail in the Articulate Mobile Player library. By default, Engage uses an image representing the type of interaction you’re building, but you can choose a different image. Just click the hyperlinked text below the image, click Picture from File, and choose an image on your hard drive. In Engage 360, you can choose which formats are included in your published output—HTML5, Flash, and/or Articulate Mobile Player. After downloading an interaction to their Articulate Mobile Player, learners can view it at any time, with or without internet access, even if you remove the interaction from your web server. Use the Properties section of the Publish window to make last-minute changes to your player, quality settings, theme colors, and playback mode. To make adjustments to your player, click the player name to open the player editor. This property controls the compression settings for audio clips, videos, and JPG images in your interaction. The quality settings default to whatever you used the last time you published an interaction. To change them, click the quality property and make your adjustments. This property shows the name of the theme currently applied to your project. To switch to a different theme, click the current theme and choose another one. This property controls how learners navigate through your interaction. To change the playback mode, click the current mode and choose a different option. This launches the published interaction in your default web browser. Important: Since your files have been prepared for web delivery, you might encounter unexpected behavior when viewing the interaction on your local hard drive. It’s best to upload your published output to a web server for proper testing. This opens a new email message with a zip file of your published interaction attached. This option is helpful if you need to send your interaction to a web server administrator for deployment. We don’t recommend emailing a published interaction to learners. Security restrictions on their computers will prevent some features in your interaction from working properly. Upload the interaction to a web server instead, then give learners a link to the interaction.html file. This creates a zipped version of your interaction files in the same location where your interaction was published. This opens a file viewer where you can see the files Engage just created. After you move the files to a web server, send learners a link to the interaction.html file, which is the file that launches your interaction. This launches the HTML5 version of your published interaction in your default web browser. Important: Since your files have been prepared for web delivery, you might encounter unexpected behavior when viewing the interaction on your local hard drive. It’s best to upload your published output to a web server for proper testing. Also, be sure to use a supported HTML5 browser. Now that you've published your interaction, it's time to upload it to a server and give it a test run. Then send learners a link to the interaction.html file. 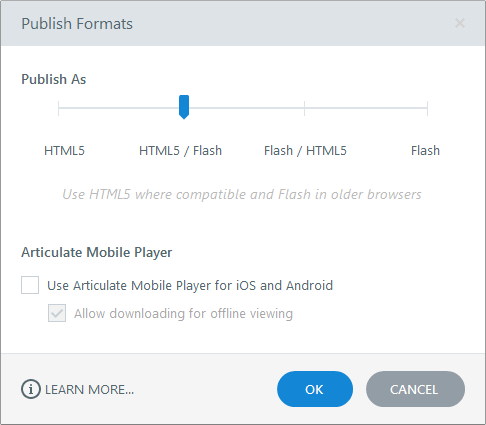 When learners launch the interaction, they'll see the right format (HTML5, Flash, or Articulate Mobile Player) based on the devices and browsers they’re using and the publish formats you included.